You are here: Home i In Focus i In focus 2018 i New measures in the fight for gender equality in the Nordics i "Finnish home care support increases inequality"
Fewer Finnish children go to nursery than elsewhere in the Nordic region. One reason is the home care support, paid to parents who chose to stay at home beyond the normal parental leave period. The organisation Mothers in Business wants to scrap the benefit altogether, calling it a trap for women. Finnish children start nursery much later than elsewhere in the Nordic region. Half of Finnish two year olds attend nursery, while in Denmark, Norway and Sweden the figure is nearly 90 percent, according to 2017 figures from the Finnish think tank Agenda. Families with children under three who do not attend nursery can be granted child care leave, collecting a small benefit from the Social Insurance Institution. At the baby café in the meeting space Lilla Luckan in central Helsinki, there is a familiar view: A group of mothers and their babies. The baby café is open to all parents, but just like it was decades ago at similar meeting points, you rarely spot fathers here. Maria is starting her child care leave with her daughter this week. How important was the family’s economy for the decision? “From an economic point of view, this is not the best solution. I earn more than my husband. But I would rather stay at home, and he would rather be working,” says Maria. So what is child care leave? It is a continuation parental leave which parents of small children in Finland take if they do not want their child to attend nursery. Home care support can be claimed until the child is three. Critics say the contribution is too low, starting at 334 euro and rising to around 650 euro, depending on the family’s total income and where they live. As a comparison, the maternal benefit, which is paid out over four months, represents 90 percent of a person’s salary. Critics also say politicians should sit up and notice that 90 percent of child care leave is taken by women in the middle of their careers, arguing the benefit works as a trap for women. Rosa, who now stays at home with the family’s second child, is also on child care leave. “In our case the father earned more than me, and since he is a business owner it was a better solution for me to stay at home. It would have been economically risky in the long term for my husband to take a break from the company. Rosa highlights an important issue which makes it hard for many families to consider early on whether to put small children into nursery. “The problem is that there are not enough nursery places, not in Helsinki anyway. The lack of nursery places near where you live is an important reason why you stay at home with the child. So I choose to live a bit frugally for a while, using savings,” says Rosa. The gender pay gap in Finland has often been explained as one woman’s euro being worth 80 cent. Recent figures from the Finnish Centre for Pensions show Finnish women’s average wage is 76 percent that of men. The 2017 statistic took into account income from both full-time and part-time work plus bonuses and perks. As a way of fighting gender pay gaps, a network of higher educated women, Mothers in Business (MIB), are campaigning to improve mothers’ opportunities to combine parenthood and work. MIB are pushing hard to get rid of child care leave in Finland. The network has developed a model for parental leave with the key figure of 9 + 9. MIB wants both parents to share parental leave exactly half and half. “If Iceland can manage to develop a 3 + 3 + 3 model where the last three months can be chosen by either parent, I believe we can definitely manage a 9 + 9 model,” says Kristiina Paavola, one of the network’s founders. She is now working on a PhD on labour market issues at the University of Tampere. “There are many factors that contribute to pay gaps in the Finnish labour market, like structural issues and attitudes. But if we want to change things on a political level through legislation, a reform of parental leave policies is completely necessary,” thinks Paavola. Paavola highlight the MIB’s desire to scrap home care support. Since mothers are usually the ones opting to stay at home, this contributes to the weakening of women’s career opportunities, she argues. “In our model, families do not lose out financially if the home care support is scrapped. Over a period of nine months, both parents would be entitled to 90 percent of their wage for the first four and then 70 percent for the final five months. This model could also tempt more fathers to stay at home for longer,” says Paavola. Mothers in Business have used an economic model which they argue would not cost more for society and the social partners than the current model does. In mid-February 2018 the government put the brakes on a parental leave reform which had been aimed at increasing women’s employment levels, while also earmarking more parental leave for fathers. The Prime Minister’s Centre Party has been a leading proponent of home care support. Long traditions with large families and traditional family values are core among the party’s strong rural base. Those who want to keep the support also argue for the right of the child to spend time at home with its parents. The reform fell at the last hurdle, yet soon after it failed several members from the governing National Coalition Party said they would raise the issue again in the coming months. Mirva Niskasaari, an MIB board member and vice judge in her professional life, says Finland is often considered to be at the forefront of gender equality issues, but that this is not always the case in the real world. 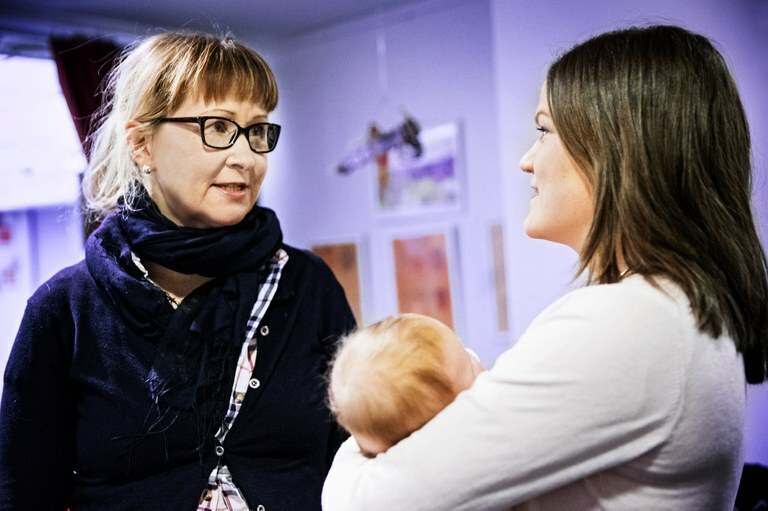 “Pretty much everyone in Finland are proud of the country’s gender equality levels, but the way in which parental leave is really divided shows we have a very long way to go before we achieve total gender equality. Today’s system, where families can chose who looks after the children, clearly does not create gender equality. That’s why we need social control,” says Niskasaari. Maternal leave – lasts for just over four months. Maternal pay is 90 percent of wages. Paternal leave – a voluntary period of slightly more than two months is earmarked the father. Paternal pay is 70 percent of wages. Parental leave – 6.5 months which both parents can share between them. 90.5 percent of parental leave is taken by mothers. Child care leave – when the other types of leave have ended, one parent can stay at home with the child until it turns three, rather than joining a nursery. The monthly pay is 338 euro, plus a bonus of up to 181 for low earners. Some municipalities also pay an extra sum for home care parents, usually 100 to 200 euro per month. 93 percent of home care support is claimed by women.